Truth is, I seldom eat fast food; not because I’m a goody two shoes and my mantra is ‘it shall never pass my lips’ but I think mostly because I work from home and there is nothing ‘fast’ about having to go out for a quick meal. I’ll make a simple pasta or bowl of soup first; heck I’ve even had Cheerios for dinner before thinking of getting in the car to drive somewhere! Still, it happens and this last time I enjoyed something enough to recreate this Burger King Chicken Apple and Cranberry Wrap. I was running errands and feeling famished and wasn’t going to be home for some time so decided to take the plunge. I saw a Burger King and soon my car was heading through the drive thru. I hadn’t been to a Burger King in years and I was hoping I could just get a Baby Whopper or something…you know, just to tide me over. Well, son of a gun…they had wraps; see what I miss from never going? The Burger King Chicken Apple and Cranberry Wrap sounded appealing and it was available either grilled or fried; I went all the way bad…yes, it was fried baby! I can’t deny, I loved it but I also knew that I wanted to make it at home. How hard could that be? It’s not! As much as I enjoyed that crispy fried coating, I don’t do much frying around here so instead decided on a favorite crisp coating for baked chicken. Too much trouble you say? Make it easy on yourself. I would make these in a heartbeat with grilled, roasted or even leftover stewed chicken. The crumb coating does add some flavor that I loved but if not in the mood? Add a few walnuts and a sprinkle of garlic salt and cayenne to up the ante on the flavor. Beyond that it’s pretty simple stuff and makes for ‘fast food’ dinner that is really fast…it’s all done in your own kitchen! Cut chicken breasts into one inch wide strips. Mix cracker crumbs and seasonings well. Place on baking sheet sprayed with cooking spray. Bake at 375 degrees F, for 10-12 minutes, until crispy on outside and lightly browned; turning once. 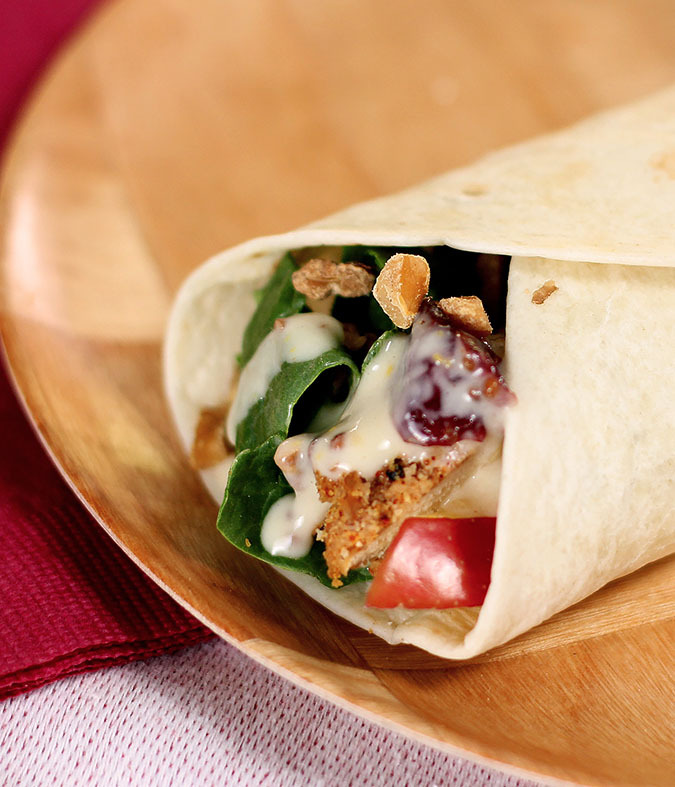 Mix the mayonnaise, sour cream or yogurt, honey, mustard and cranberries and set aside. Layer on each tortilla the lettuce, chicken, spread and apples. Fold, serve and enjoy! I just wanted to share that I used this recipe to help get rid of Thanksgiving leftovers and it was awesome. I substituted turkey for the chicken (didn’t do the breading or the extra baking, just inserted roasted turkey in) and used the cranberry salad for the cranberries. It was so yummy! Thanks for sharing the idea. So easy too; I can not deny I’ve been having one every couple of days now that I’ve got the good at home! I had no idea they had wraps like this at Burger King! May just have to stop in there sometime soon. Or…even better, I could just make this at home! Great recipe, Barb. Shh, don’t tell; I was sort of craving one today and I was out of my baked chicken! I’m sure it is but part of that is my not frying it. Which I love but which I do try to avoid. Doggone it! I don’t know what it is about mixing fruit with protein but it is seriously one of the most amazing combinations out there. I could eat every day, wow. I love the flavor combinations, and how easy and delicious this is! I haven’t tried BK’s, but there is no doubt in my mind that yours is WAAAAY better!! 🙂 Looks great! Can’t think of the last time I was in Burger King (I am a sucker for Chick-Fil-A though). I had no idea they had wraps either and this home version looks great. My next taste of fast food might have to be a quick drive to your house for this wrap!! I’m with you on fast food – I’m usually at home, so fast food isn’t. I really like the cranberry spread in this – such great flavor. And I’ll put chicken in any wrap anytime. Good wrap. And fast! 😉 Thanks for this. I stopped eating at fast food places like MacDonald’s and Burger King a long time ago mostly because of the not so good for you (that’s being polite) food that was on the menu at the time. But I became adamant about never going there again when I learned how they control such large portions of our food system and how that has changed as a result of their quest for cheap food. 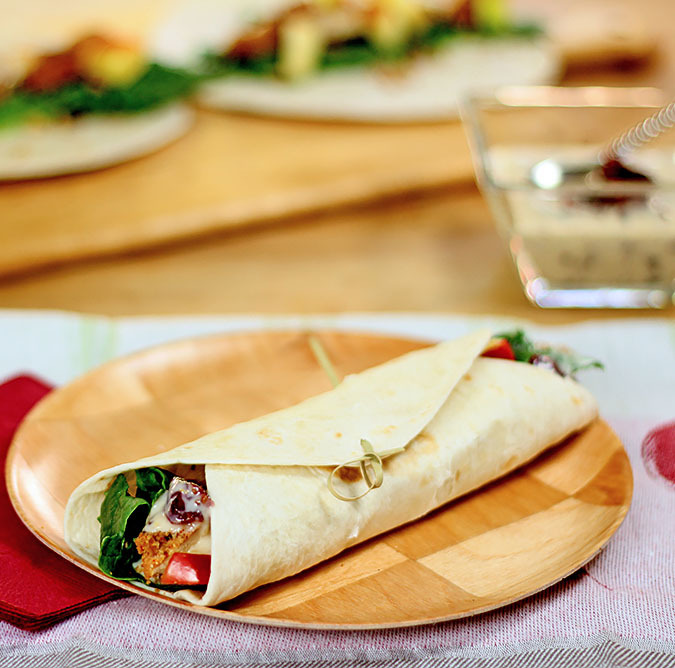 But the idea of this wrap sounds delicious and I just might be making it today! I don’t often do fast food either but I could definitely try this. Your rendition looks wonderful. Do you think you could figure out the secret to Firehouse Subs and pass that on to me? Yummy! Looks like a great quick meal. I bought a chicken wrap at the store last week and it was so good that I’ve been drooling over the idea of making them at home. Love the sweetness in this one, bookmarking to try.